OUR STORY: The Big Sur River Inn story began in 1888 when Jay Pheneger acquired a 160-acre parcel from the federal government and gave his name to the creek that bounds the River Inn on the south side of the property. Barbara and Michael Pfeiffer, who had already homesteaded and were farming near Pfeiffer Beach, purchased the Pheneger property around the turn of the century. 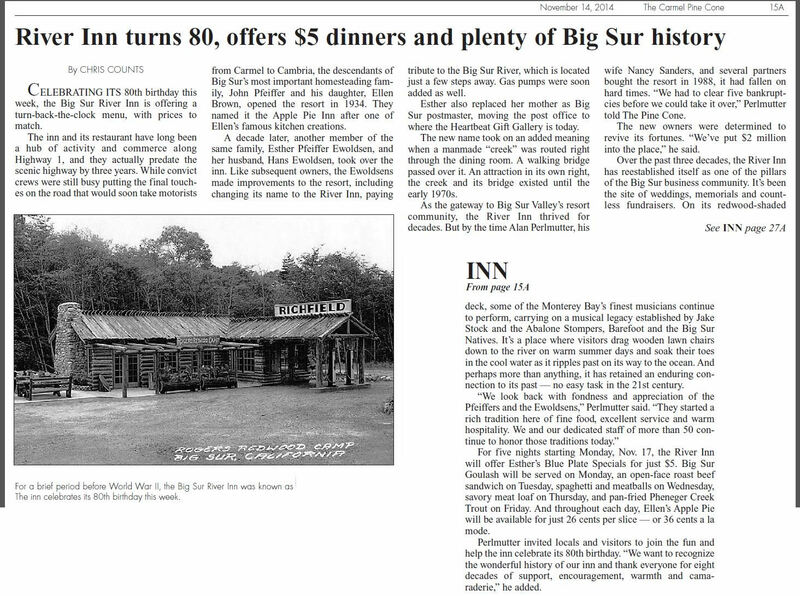 In 1926 John, Michael and Barbara’s son, took over the land on which The Big Sur River Inn now stands. His daughter, Ellen Brown, opened the Inn in 1934 – along the river on the east side of the dirt road that would later become Highway One. Ellen began by serving “Hot Apple Pie” to guests, opening her living and dining rooms to the public. Lodging units were built and Big Sur’s first resort Historic Big Sur River Inn was established. Her famous Apple Pie, which is still on the menu today, gave the place its original name — “Apple Pie Inn.” A photograph of the original Apple Pie Inn (c.1934) still hangs on our dining room wall. The ridge that rises above the east side of Highway One, behind the Inn, is still known as Apple Pie Ridge. When Ellen left Big Sur in 1937 her mother Florence took over the Inn. As the paved Highway One between Carmel and the Hearst Castle was completed, Ellen’s house was moved to the west side of the road. The home was converted to a dining room and kitchen. Gas pumps for the new filing station were installed and the Inn’s name was changed to Redwood Camp. In 1943, Florence’s daughter, Esther Pfeiffer Ewoldsen and her husband, Hans, took over the operation. In Esther’s own words … “the place was renamed ‘The River Inn’ in hopes of keeping the river out … because in those days the river often rose up during the winter storms to the level of the dining room door.” Esther replaced her mother as Big Sur Postmaster (Esther was careful to point out the title is not Postmistress… but Postmaster) and the Post Office was moved to the River Inn, situated where the HeartBeat Gift Gallery is today. Over the years as the Inn changed hands – the Crawford and then the Warcken families put their energy and skills into keeping up with tourism and the rising popularity of the Inn. In 1988 the Perlmutter Family and a small group of friends purchased the River Inn to “bring value to their guests, staff, community and partners.” Renovations began immediately in the restaurant, rooms and General Store, honoring the history and natural beauty of the property. CHAIRS IN THE RIVER… somewhere along the way, guests began to take our large wood lawn chairs down to the river and spend hours relaxing in the river…literally, in the river…renewing their spirits with the soothing river running under Music on the Big Sur River Inn deck.their toes and a beverage from the bar above. Over the years we became known as the ‘place with the chairs in the River” which became our logo and trademark. The Big Sur River Inn has become a beloved landmark, known for our devotion to the Big Sur community. We are deeply committed to supporting the organizations that sustain our community including the Big Sur Fire Brigade, Big Sur Health Center and our local schools. We have become famous for hosting amazing and spectacular fundraisers in support of friends and neighbors in need. We celebrate milestones and special occasions all year long at the Big Sur River Inn. The Pfeiffers and the Ewoldsens started a tradition at the Big Sur River Inn of fine food, excellent service and warm hospitality. The Perlmutter family and our dedicated staff – more than fifty “River Innmates” continue to honor those traditions each and every day. Emma Parlons, Lifestyle Writer, loves the River Inn Burrito Bar!